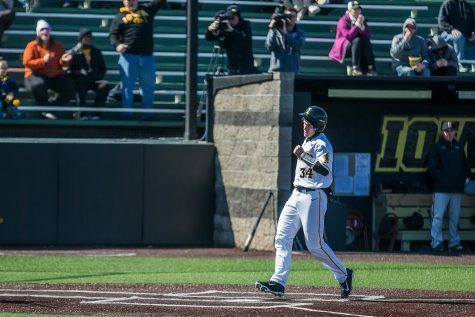 Iowa won its series against Rutgers despite dropping the finale on Saturday. 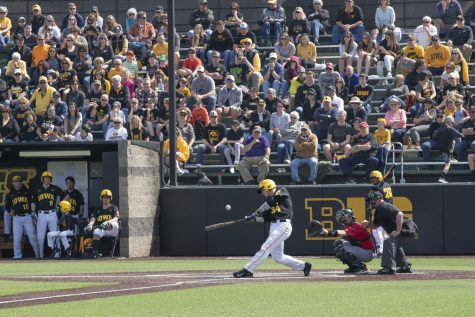 Iowa catcher Austin Martin watches the ball at the Iowa vs Rutgers game at Duane Banks Field on Friday, April 4, 2019. 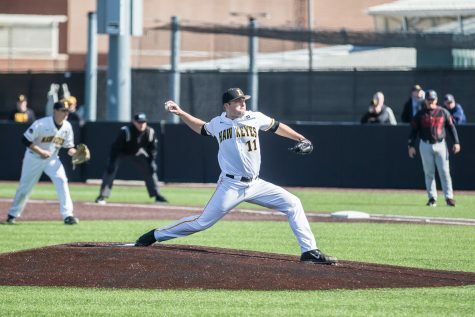 The Hawkeyes defeated the Scarlet Knights 6-1. 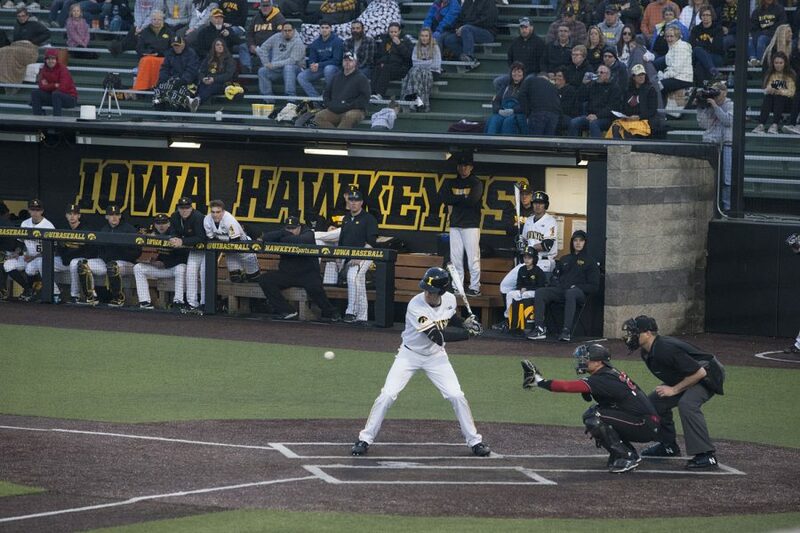 On April 6, Iowa closed out its series against Rutgers, splitting a doubleheader at Banks Field. 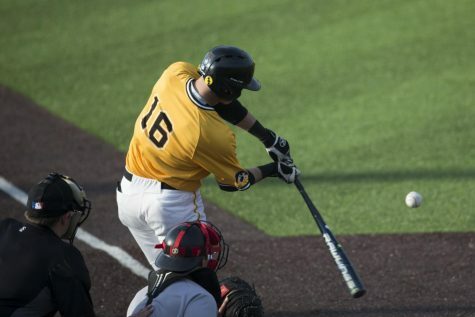 In the first game, the Hawkeyes came out on top, 9-5. 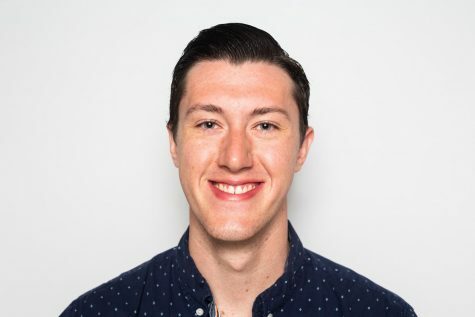 The second game was almost the complete opposite; the Scarlet Knights won, 15-3, in a game in which Iowa struggled to find any sort of offense. 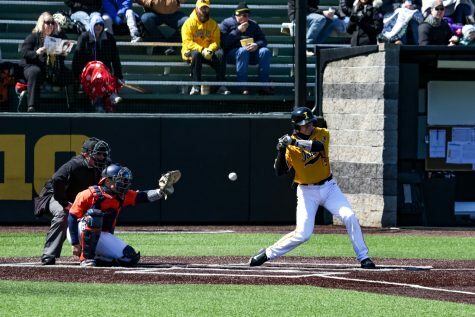 Rutgers had more than double Iowa’s hits in the second game. The Scarlet Knights’ 15 runs came on 15 hits. 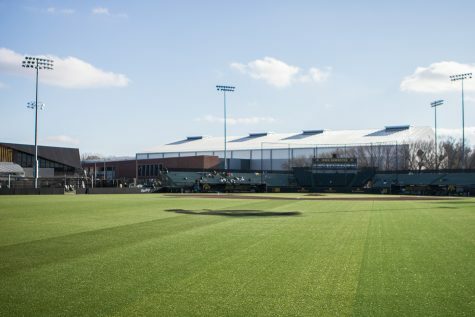 Entering April 6, Rutgers ranked ninth in the conference with a .238 batting average, and the Knights were one of just five teams in the Big Ten with fewer than 230 hits on the season. Rutgers’ bats caught fire right from the get-go in the second game, scoring 5 runs in the first inning. Two RBI singles and a 3-run home run were just a preview of the Rutgers’ offense. In total, four Scarlet Knights recorded 2 or more hits. Chris Brito led the way, going 3-for-4 at the plate with 3 RBIs and a home run. Zeb Adreon went 3-for-3 in the first game. 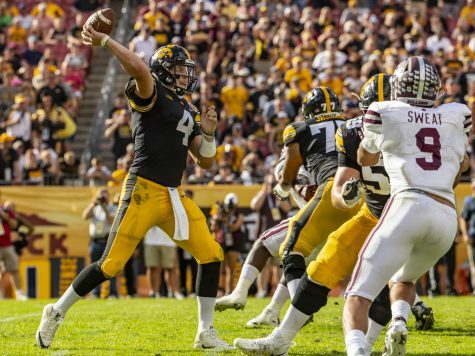 The junior from Pleasantville cranked out a spotless outing to lead the Hawkeyes in their best offensive output in the series. He notched 4 RBIs as well. He finished with a single and two doubles. 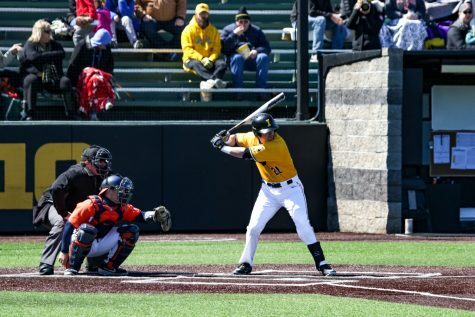 Aside from Adreon, Connor McCaffery was the only other Hawkeye to record 2 hits or more in the game. Every Hawkeye pitcher who lasted 0.2 innings or more gave up at least 1 run. 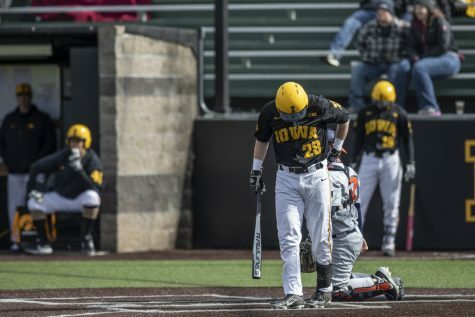 The second game did not favor the Iowa pitchers. 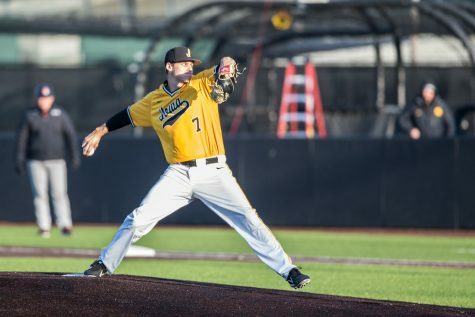 Shane Ritter was the only arm not to allow a hit, and he was on the mound for just 0.1 inning. Grant Judkins received the starting nod, and in his 5 innings, he gave up 6 runs on 7 hits. He struck out a pair of batters as well. After giving up Rutgers’ initial 6 runs, Judkins held his own, tossing three scoreless innings before exiting. From there, Duncan Davitt took over. In his 2 innings, the Scarlet Knights tacked on 3 runs with 3 hits. Kyle Shimp gave up 3 runs on 2 hits in his 0.1 inning. Drew Irvine and Clayton Nettleton combined to pitch for 1.1 innings. Rutgers totaled 3 hits and 3 runs while they pitched.